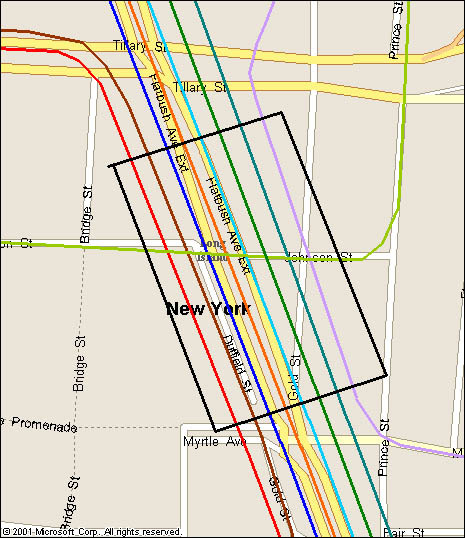 Brooklyn Center is clearly the most complicated junction on any subway system. Here nine routes combine into one station. Here there are four platforms hosting eight tracks on each of two levels, with one more platform and pair of tracks on the lowest level. The upper level hosts service to Manhattan, while the second level carries service to Brooklyn and parts of Queens. The lowest platform serves the Brooklyn-Queens Crostown Line. In additon to this vastly versitile station complex, there is no interlocking plant for this station. Trains do not change tracks or routes at this point. Any switch plant here is controled by the main dispatcher and is only used to flex service around problem areas. A snapshot of what service here looks like may be seen by these "direction signs."